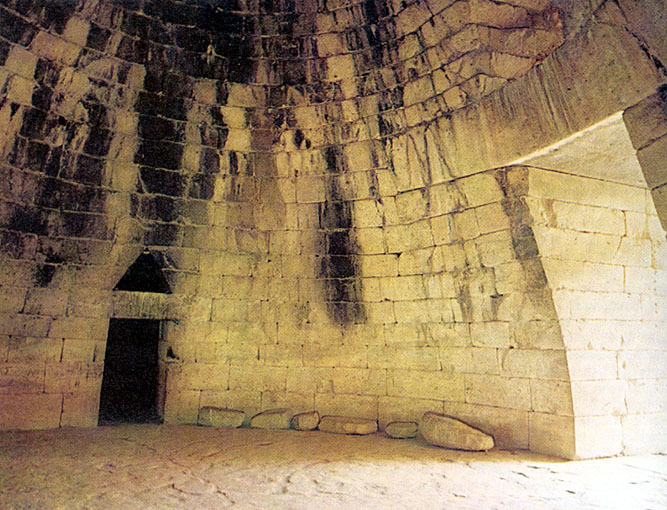 The tholos tomb first appears in the mid-sixteenth century BCE in the western Peloponnese of Greece. It arrives at Mycenae around 1500 BCE. Its origins are obscure. Some believe it may have developed from a type of circular tomb found on Crete in the third millennium. Others have argued that tholoi are translations of earlier chamber tombs into a more durable form. There are nine tholoi at Mycenae. The best preserved, mistakenly named The "Treasury of Atreus", is a huge circular chamber built of finely cut rectangular stones. 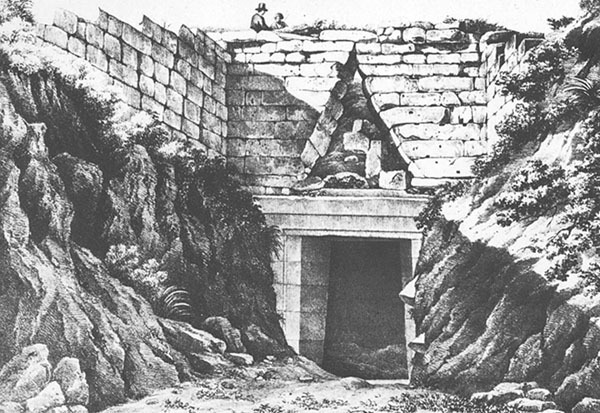 The tholos is approached along a dromos or pathway about 20 feet wide and 118 feet long. The side walls are cut out of the rock and lined with ashlar. 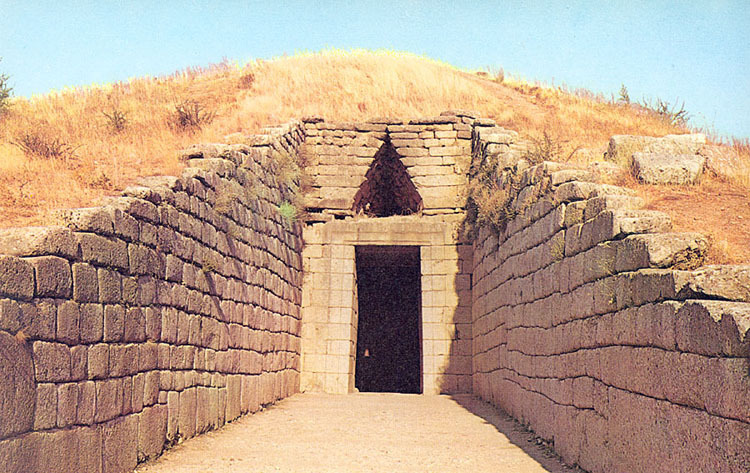 The door of the tholos is over 16 feet high and tapers inwards towards the top. A short corridor covered by two huge lintel blocks (weighing over 100 tons) leads to a corbel-domed interior space. Above the doorway lintels is a relieving triangle. The same kind of entrance, on a smaller scale, also leads from the main domed chamber into a smaller side chamber. Most likely the relieving triangles of both doorways were originally filled in with carved stone blocks of the type that also decorated the rest of the façade. The main chamber measures nearly 48 feet across and 43 feet in height. The corbeled dome, built of cut masonry within the contour of the enclosing hill at the lower courses, is buttressed on the outside by earth as the dome rose above the surrounding rock. The top of the dome may have protruded above the earth of the artificial hill. 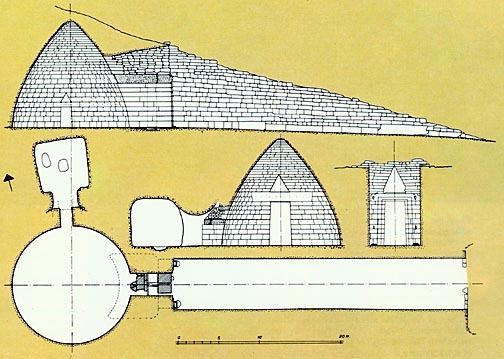 The curving form of the walls of the dome cause it to resemble an enormous beehive. Against the outer side of the main doorway stood a pair of engaged half-columns in green marble. Above, on either side of the relieving triangle, was another pair of smaller engaged columns in red marble. 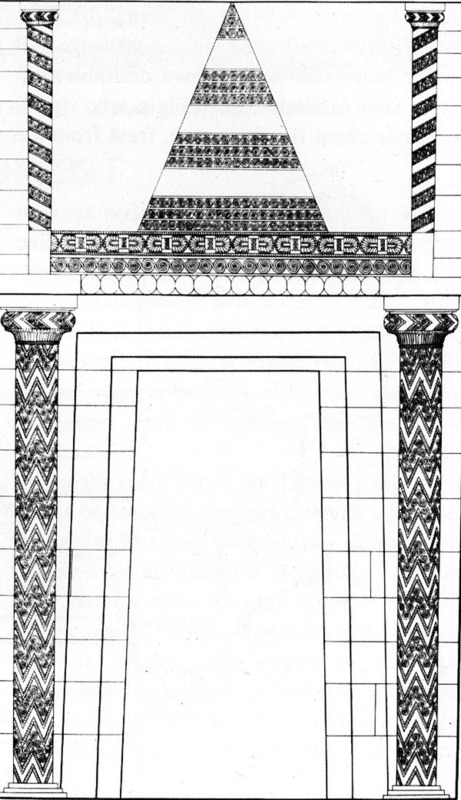 The larger columns were decorated with a chevron pattern and spiral motifs. A chevron pattern also decorated the Minoan-like pillow capitals. Following a burial inside the tholos the entrance was walled up until the next time it was needed.